Sandy’s opening gusts on Long Island. Today is far from a beautiful day. Sandy is on her way, and Joe and I have packed up the yard and we’re now inside watching fall actually fall. Autumn foliage is falling like confetti now, as the first gusts of wind make their way to Long Island. 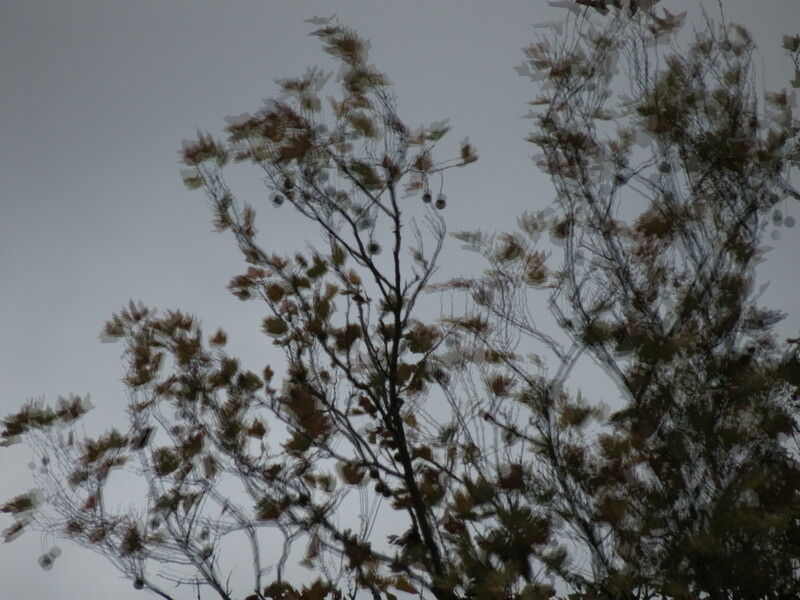 Flocks of birds are racing for cover; squirrels are gathering their provisions. Even the air feels strange. Sandy is a tropical system, but the air is chilled, as the tropics crash into a cold front. And that’s why I find it so ironic that I’m creating a post about beautiful things. I can think of so many things that are beautiful. Sunsets. Rainbows. Dahlias. Maybe even waves of blowing leaves on a gusty day. But something with the words “nitty” and “gritty” and “dirt?” No way. 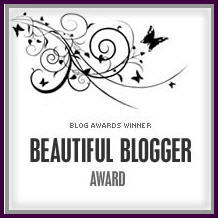 When I received a comment from danajoward announcing that she nominated this site for the Beautiful Blogger Award, I – well – I couldn’t be more surprised and honored. So, thank you, danajoward, for the compliment and recognition. If you have never visited her blog, you are missing the work of someone who is always up for a challenge. Her site is filled with her photography and writings, each of which satisfies an assortment of creative blog challenges – and each post provides a peek into her creative mind. Well done. Speaking of peeking, I now have to reveal seven random facts about myself – although I’m not sure some of these actually qualify as beautiful. 1. I love to read, and I only wish I had more time to indulge. I’m a huge fan of historical fiction. Among my favorite authors are Edward Rutherfurd, Margaret George, Ken Follett, and Diana Gabaldon – although I did lose interest in her Outlander series after the characters left Scotland for America. 2. I also enjoy reading dystopian fiction. Among my favorite reads are 1984, The Handmaid’s Tale, Anthem, and Atlas Shrugged. 3. I am severely allergic to penicillin. Hives, swelling, and closing throat — clearly not beautiful! 4. I’m a member of a bagpipe band, and this past summer we participated in several competitions. It was my first time competing as a piper – and we placed 7th in the first competition and 3rd in another competition. 5. In my early 40s, I was diagnosed with Coronary Artery Disease after I failed a stress test and suffered a very mild heart attack. I now have 13 stents helping to keep my coronary arteries open. 6. I love board games. As a kid, Monopoly was always a favorite until my younger sister figured out that Boardwalk and Park Place were two properties worth buying. I then switched over to Risk. 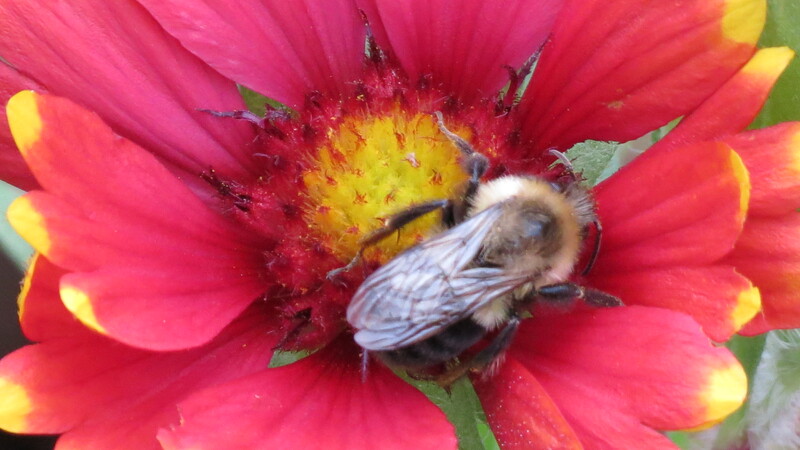 The chilly tropical air snuck up on this bee, still sleeping on a bed of Gaillardia pollen. Now for the fun part – my 15 beautiful nominations. There are so many blogs that should be part of this list, but I thought I would concentrate on some newly found treasures. 1. GiRRL_Earth: Meeting a kindred spirit in the blogging world is a beautiful thing. That’s how I feel about this blog and blogger, one who shares the same tastes in music, movies, viewpoints . . . Her site has morphed from a strictly gardening type to something so much more personal. 2. Casa Mariposa: One beautiful garden plus one beautiful life philosophy plus countless beautiful photos equals one beautiful blog. 3. The British Gardener: The man behind the blog is a Brit living in Virginia – so he not only brings his English gardening sensibilities stateside, but also his sense of humor. By all means, please visit one of his most recent posts on a newly issued warning about zombie gnomes. LOL material! 4. Travel Garden Eat: With three of my favorite activities in the title, how could I not find this blog beautiful? 5. Gardens at Waters East: Here is a garden blog with a beautiful view: Lake Michigan. 6. Crabtree Gardens: It’s difficult to pin this blog in a category. On the one hand, it’s about a garden and a gardener, but when the gardener also owns an English-inspired B&B and a 5-acre naturalized garden – well . . . Let’s just say it’s beautiful. 7. The Lazy Woman’s Garden: The photo on the landing page of this blog will win you over – the gardener’s view of her garden as she lounges on her hammock in central Florida. 8. Bodhisattvaintraning: I am completely captivated by the free-flow of thoughts in this blog. It’s random, it’s emotional, it’s sharing – so much. 9. Pattu’s Terrace Garden: This blog has literally opened up the world for me. Based in India, it’s about one woman’s passion for her terrace garden – amazing what she is able to grow in pots. 10. The Heartbeat Girl: In my previous life, the writer of this blog and I worked together. Time moved us in different directions and we lost contact – until recently. That’s when we learned that we are both blogging. Her writing is honest, sentimental, tender, and always warm. 11. The Gift of Travel: The woman behind this blog has been literally under my nose for years. We just didn’t know that each one of us had started blogging. By chance, we came out of the blogging closet to one another. I’m completely enjoying watching her blog be born. 12. The Cheapskate Urban Gardener: How can I not find beauty in a title with the word cheapskate? Besides, the blogger might be economical, but his results are rich. 13. African Violet Ramblings: A gorgeous blog that is a tribute to a beautiful plant, everything from propagation to care. 14. Journey with Julia: Every so often, a blog enters your life and each post carries you deeper and deeper. This is one such blog: honest and open and courageous as Julia shares her life’s journey. 15. Any of the blogs listed under “Garden Blogs I Like.” This might be cheating but there’s just too much beauty out there to fit in a list of fifteen. Again, many thanks to danajoward. 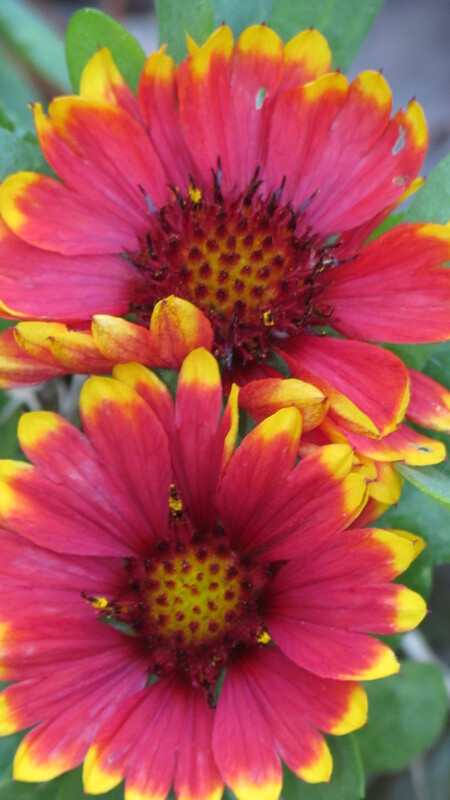 Happy gardening — and if you’re in the path of Sandy, stay safe! Again, my thanks to you for recognizing this site. Right now, I’m watching the endless news coverage and gusts of wind. I’m sitting on Long Island — playing the waiting game, while trying stay calm as I listen to the anxiety-producing news coverage. It’s very strange because it’s cool outside, not warm and tropical. The biggest worry is severe flooding along the coast and trees bringing down power lines. Normally, these hurricanes speed through the northeast — but Sandy is moving slowly and will linger over the region. Should be quite the ride. Many thanks! Hope all is well with you. I hope Sandy will be gentle with you !!! Here in Belgium we don’t have hurricanes (yet ?) but we see on tv how horrible they are ! I’ll keep my fingers crossed for all of you over there. And yes, thanks, all is well with me. Hi Gwennie. Hurricanes are an interesting monster. Thanks for your well wishes. Interesting ??? scary you mean and deadly ! I just heard on he news there are already about 15 death’s ! I really have been thinking about all of you over there !!!! How about your home and garden ? Not too much damage I hope ! I saw the damage on tv, it is huge ! Hi Gwennie. I was very fortunate — the house is not damaged and the garden is a little weather-beaten, but fine. The news footage is mostly of the communities that are along the coast. Very tragic — and with each passing hour, the news seems to be going from very bad to worse. so sad for the people involved ! Each day, more horrible news arrives — open gas lines that are igniting, raw sewage in the flood waters, etc. And then, there are the glimmers of hoe and heroism and survival. It will be a long recovery. I also heard there were plunderings, how can you do this to people who already lost so much ! And the estimated costs and the loss of lives ! This is a big blow to the US. I agree with you that it is a tragedy on top of a tragedy — but I also know that there more good people out there and, in the end, we will recover. In time. Ofcourse you will recover from Sandy ! It will take time and a lot of money. I saw people on the news who lost everything, sooo sad !! I agree. I actually find myself turning away from the news — it’s too much. By the way I dance while I drive too ha ha and sing Very loudly when no one else is in the car…or have complete silence, as the mood takes me. I hope Sandy doesn’t cause major problems for you! I enjoyed reading random facts about you, and thanks for a list of some great blogs, some I am unfamiliar with. Hi Deb. So far, I’m waiting and waiting. I’m not in a flood zone, but strong winds might pose a problem. I’ll do my best to keep readers posted — power permitting. I have many friends on the east coast and I’m so concerned. I have never been anywhere near a storm of this potential magnitude. I hope you and Joe will not be too affected, and certainly no property damage. What a nice list of blogs. And I’m with you about show tunes. I have a counter to Les MIs (movie) on my blog side bar. I’m quite excited! Hi Debra. It’s been a long night and day and night. As soon as I can, I’ll post some photos of the aftermath. Until then, let’s sing! As I sit here reading with the strong winds outside i am surprised and honored to be included in the nominations…im not sure what it means or what Im supposed to do…hopefully someone will explain!…thanks again so much…. Thank you for your beautiful words you share with us . I am excited to check out your favorite bloggers. I have really enjoyed moving from my garden in Moreland Hills, Ohio to the gardens expressed so eloquently through words of imagination. Alberto!! I like your thinking. I know right now that I will be tree shopping — we lost a good piece off of a large evergreen that was planted in 1966. Any ideas? You are so welcome! Be well. I sure do wish I had known about those Zombie Gnomes before I settled upon my Halloween costume. What a great sense of humor that blogger has. Thanks for the links. Sandy is picking up now. Be safe. Never mind the jazz hands — it’s the fan kicks that can be a little tricky! 🙂 Hope you are managing Sandy. Many thanks. We’re lucky that we do not live along the water. Our coastal communities are taking the brunt of the storm.